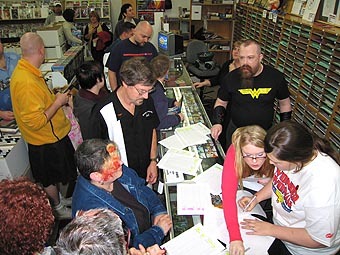 On October 29, throngs of families and Wonder Woman fans visited Excalibur Comics for WONDER WOMAN DAY, culminating in a charity auction organized by Andy Mangels. 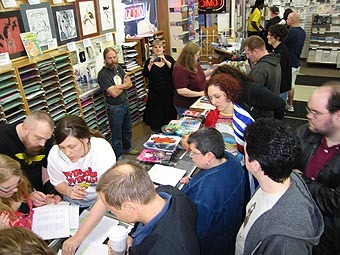 The auction of artwork and memorabilia raised approximately $12,000 for two nonprofits: the Bradley-Angle House and Raphael House of Portland. 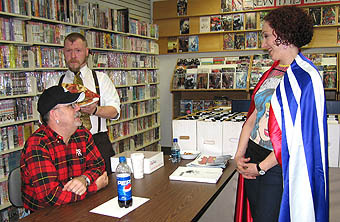 Right: Anina plays sidekick to a Lynda Carter stand-in. Costumes by Don Hood. Above: Anxious bidders hover as the silent auction draws to a close. 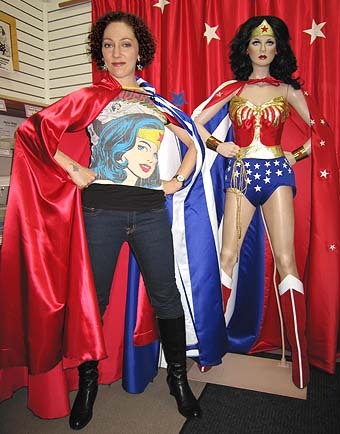 More photos of the event can be seen at the Wonder Woman Museum. Right: Anina and Don take a break from the fray. What else was Anina doing this weekend?